Life does not continue on the same pace. We go through different times and moods, like joy, happiness, stress and frustration. When you go through difficult times you will be frustrated and depressed. Here are some types of foods that help to improve the mood effectively. Here we refer to fish rich in omega- 3 and fatty acids. Eating fish rich in omega- 3 fatty acids helps to better the bad mood greatly. This element is available in abundance in lemon fish, tuna, sardines, herring and fish oils. It has great influence in improving the mood. This happens as a result of raising the proportion of serotonin in the brain because of the sugar it contains. Also, eating chocolate leads to sending signals to the brain to improve the mental state of the person significantly. 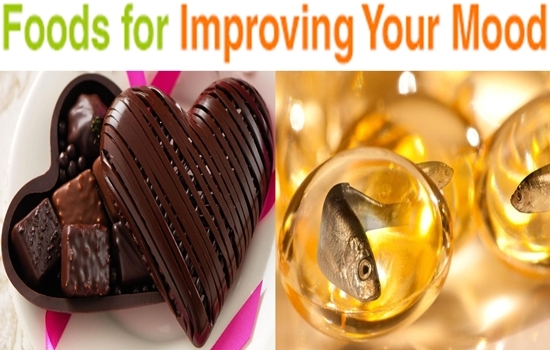 When you feel a strong desire to eat chocolate, it means that you need to improve your mood. Like pasta, potatoes and bread. These kinds of foods play an important role in improving the mood as they work to promote the level of serotonin in the brain, which reflects positively on the psyche of the person and his mood. Vitamin D is known as the vitamin of the sun, as we can get it by the exposure to the sun for at least 1 hour or even 45 minutes every week. This vitamin has a significant effect on improving humans’ mood and psyche. You can get vitamin D also from milk and salmon. Vitamin B also plays an important role in improving the mood in general because of its effect on increasing the level of serotonin (the hormone of joy and happiness) in the brain. Foods containing vitamin B includes dried beans, dairy products, eggs, chicken, fish, whole grains, avocados and bananas.